This broad, intensive course is 20 weeks (800 hours) $15,900. Become a master dog trainer and learn every skill and technique you will need to train tracking dogs, protection dogs, obedience dogs, service dogs, and more. At the Indiana school for dog trainers, you will work with experienced dog trainers and a wide variety of canines to put into practice the skills that you learn and gain a comprehensive knowledge of all breeds and types of dogs. 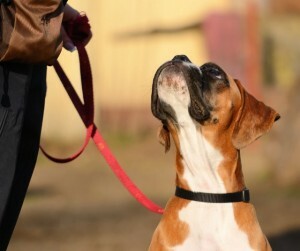 The Dog Trainer College offers an array of courses to help you become a confident, competent and effective dog trainer. The Master Trainer comprehensive course combines the skills and techniques of other courses so you will learn how to teach dogs in obedience training, protection, scent detection, service dog training, human remains detection, man-trailing, police/military k9 work, as well as Search and Rescue. You will also learn integrative business marketing techniques and management skills needed to promote your canine business. This course meets Monday-Friday from 9am to 5pm. The Master Trainer schedule includes start dates of July 1, 2019, March 2, 2020, and July 6, 2020. The more services you offer, the more potential there is for income! Graduates of the Master Trainer course will be ready to start or expand their business and train many different types of dogs in any role. Call today for more information or apply online to become a dog trainer or expand your skills. Please note that the Master Trainer Course is only available in the Spring (March) and Summer (July) semesters. Graduates receive certification as a Master Dog Trainer. Both financial aid and/or lodging is available, if needed. With our competitive financing options, you can take this tremendous course for as little as $375/month*. This course is eligible to be covered by GI Bill education benefits for US veterans. Please note: All students in this course will be involved as a decoy, helper, and handler. This will include bite-work with dogs in real-life settings. While safety measures will be in place, injury and/or death is a possibility. Those who are unwilling to be involved in this element of training should not apply to the Master Trainer course.